The Black Lives Matter flag was raised over Norris University Center on Jan. 3 to commence two weeks of programming around the state of black lives in America. Two student groups cohosted a panel Tuesday about the intersectionality of race and queerness as part of the event. A Black Lives Matter flag was raised over Norris University Center on Tuesday morning, kicking off two weeks of student-organized and administration-backed programming on the state of black lives and the Black Lives Matter movement in the United States. Danielle Harris, a Communication senior and student organizer of the programming, said the University of Vermont’s student government’s decision to fly a Black Lives Matter flag near the student center in September inspired her to do something similar at NU. “After seeing that … the immediate question is, ‘If the University of Vermont can do that, then how come Northwestern can’t do that?’” Harris said. Harris said she and other students began reaching out to administrators at the beginning of Fall Quarter to organize events that cultivate dialogue around “the statement ‘Black Lives Matter,’ the greater Black Lives Matter movement, and the state of Black lives within our country,” according to the initiative’s Facebook event. 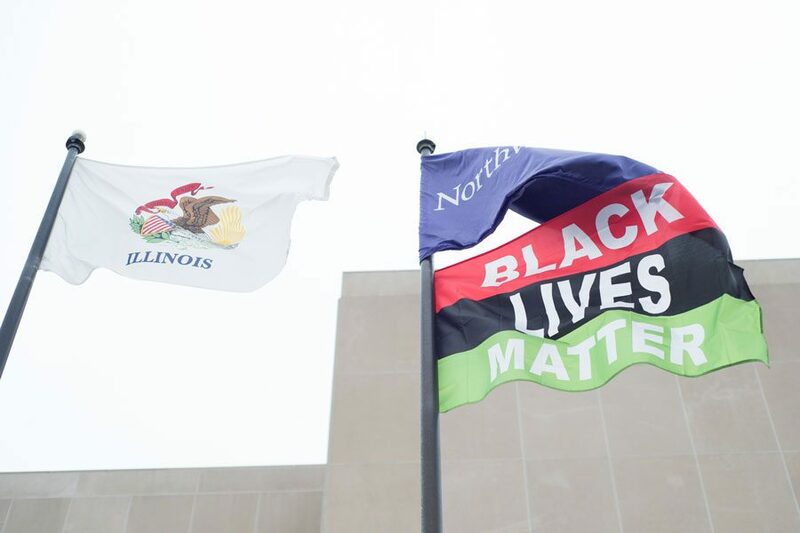 These efforts resulted in “Black Lives Matter: a Northwestern dialogue,” two weeks of on-campus programming that began Tuesday morning with raising a Black Lives Matter flag. The programming includes various talks and open forums hosted by numerous campus groups such as Black Lives Matter NU; a screening of the movie “13th” hosted by A&O Productions on Wednesday; and a candlelight vigil for lost black lives hosted Sunday by Delta Sigma Theta Sorority, Inc. at Alice Millar Chapel. The flag will remain on a flagpole at Norris for the entirety of the two weeks. Harris said the dialogue is intentionally not run by a single student organization, so students can discuss the Black Lives Matter movement outside the framework of a single campus group’s mission. Individual organizers reached out to contributing groups to best match their objectives, Harris said. Associated Student Government Vice President Macs Vinson highlighted the importance of bringing different students together and said he hopes more groups will become involved. Harris said Norris staff, particularly executive director Jeremy Schenk, were helpful in finding spaces and resources for the programs. Schenk said he believes the administration’s role is to support the students who are heading this initiative. Schenk described the dialogue’s educational content as “fantastic,” commending the organizers for fostering discussion about how the state of black lives and the Black Lives Matter movement in the United States intersect with the Northwestern experience. Harris said the two weeks are meant to educate the Northwestern community and students who may not currently be engaged in such conversations. She added that she hopes minds can be changed and opened. The flag is not only meant to educate students but also to support black students on campus and nationwide, Harris said. If she could choose, Harris said she would keep the flag up past the designated two weeks.